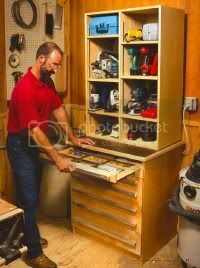 “I started to work on a system of 1?4″ hardboard inserts for storing saw blades, router bits and sanding supplies-including discs and sheets-turning the cabinet into a very functional part of my shop.” This one gets my reuse/recycle award – very clever way to reuse old file cabinets! 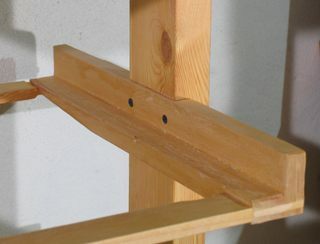 “Besides providing storage, this tool shelf solves another nagging problem as well — it keeps the power cords from getting tangled up like spaghetti.” Smart, simple, addresses common power tool storage problems. What more could you ask for… it’s a free plan! “This bin rotates on a pair of lazy Susan rings to maximize corner space and provide quick, easy access. A stationary upper shelf secured to the wall steadies the bin so it’ll spin easily and won’t tip over.” I think this is one of those good ideas in pictures but kind of lame in practice… You tell me. I was won over by the idea though. “I had been contemplating buying or building a table saw extension wing for some time and finally decided on making a simple cabinet on wheels. This cart is the result.” No plans, just pics and descriptions. Here’s how to make a simple pegboard cabinet that can greatly increase your storage area. Great site and great tips. 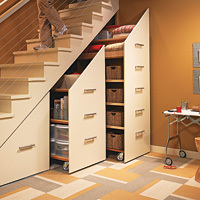 Alot of those designs are pretty smart and some (like the rollout-finished organizer under the stairs) I hadn’t thought of before. You’re invited to check out a revolutionary new storage/work system for woodworkers — the Portable Carpentry Workshop (PCW) at The Wood Working Shows in Somerset NJ, February 19-21, 2010. Booth #421. http://www.thewoodworkingshows.com. Invented and designed by Fred Cona, a 23+ year union carpenter from Brooklyn, the Portable Carpentry Workshop (PCW) solves a major problem for contractors — the amount of time wasted setting up and the amount of space used by tools and equipment on job sites. http://www.rollingtrades.com. With the PCW, it’s Roll it up, Plug it in, BANG IT OUT! 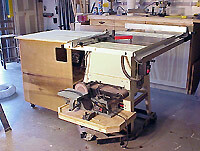 This rolling workshop has plenty of storage and is designed to house a table saw, miter saw and router. It increases productivity by eliminating costly set up and dismantling time and eliminates the need for a second person to help cut sheet goods or long lengths of lumber. The compact design and easy maneuverability are perfect for job sites, small shops and garages. All tools are centralized, contained within one transportable compartment and with an internally located power strip. Tools work from a single plug. For security, the PCW locks. The PCW has received the INPEX 2008 Grand Prix Award and a Gold Medal in the Construction Category. Rolling Trades Inc. is currently seeking a manufacturer for mass production. Investment opportunities are currently available.